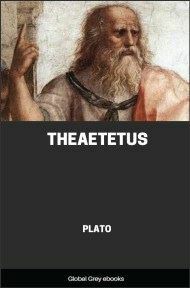 The Theaetetus is one of Plato's dialogues concerning the nature of knowledge, written circa 369 BC. In this dialogue, Socrates and Theaetetus discuss three definitions of knowledge: knowledge as nothing but perception, knowledge as true judgement, and, finally, knowledge as a true judgement with an account. Each of these definitions is shown to be unsatisfactory. The dialogue is framed by a brief scene in which Euclides tells his friend Terpsion that he has a written record of a dialogue between Socrates and Theaetetus, which occurred when Theaetetus was quite a young man. This dialogue is then read aloud to the two men by a slave boy in the employ of Euclides. Euclid. But I was not in the city. Euclid. As I was going down to the harbour, I met Theaetetus-he was being carried up to Athens from the army at Corinth. Terpsion. Was he alive or dead? Euclid. He was scarcely alive, for he has been badly wounded; but he was suffering even more from the sickness which has broken out in the army. Terpsion. The dysentery, you mean? Terpsion. Alas! what a loss he will be! Euclid. Yes, Terpsion, he is a noble fellow; only to-day I heard some people highly praising his behaviour in this very battle. Terpsion. No wonder; I should rather be surprised at hearing anything else of him. But why did he go on, instead of stopping at Megara? Euclid. He wanted to get home: although I entreated and advised him to remain he would not listen to me; so I set him on his way, and turned back, and then I remembered what Socrates had said of him, and thought how remarkably this, like all his predictions, had been fulfilled. I believe that he had seen him a little before his own death, when Theaetetus was a youth, and he had a memorable conversation with him, which he repeated to me when I came to Athens; he was full of admiration of his genius, and said that he would most certainly be a great man, if he lived. Terpsion. The prophecy has certainly been fulfilled; but what was the conversation? can you tell me? Euclid. No, indeed, not offhand; but I took notes of it as soon as I got home; these I filled up from memory, writing them out at leisure; and whenever I went to Athens, I asked Socrates about any point which I had forgotten, and on my return I made corrections; thus I have nearly the whole conversation written down. Terpsion. I remember-you told me; and I have always been intending to ask you to show me the writing, but have put off doing so; and now, why should we not read it through?-having just come from the country, I should greatly like to rest. Euclid. I too shall be very glad of a rest, for I went with Theaetetus as far as Erineum. Let us go in, then, and, while we are reposing, the servant shall read to us. Terpsion. Very good. Euclid. Here is the roll, Terpsion; I may observe that I have introduced Socrates, not as narrating to me, but as actually conversing with the persons whom he mentioned-these were, Theodorus the geometrician (of Cyrene), and Theaetetus. I have omitted, for the sake of convenience, the interlocutory words "I said," "I remarked," which he used when he spoke of himself, and again, "he agreed," or "disagreed," in the answer, lest the repetition of them should be troublesome. Euclid. And now, boy, you may take the roll and read.